Triking on the German Baltic Coast or Murphy lives! Unfortunately a recent bout of illness means that if I am going to cycle in future I should use a recumbent with electrical support. As my sense of balance is largely in the bucket, as the Germans say, it looks as if three wheels would be better than two. I do want to cycle in future, so we plan to slaughter the piggy bank and will triking around the cycle paths and minor roads of Baden Württemberg, Hesse and Rhineland-Palatinate with a grin on our faces. Being cautious souls before handing over a wadge of coarse notes to our Local Bike Shop (LBS) we decided to hire a pair of trikes for a few days to be sure that trikes are as much fun as their protagonists make out. We decided to hire from Ostsee3rad, Olaf Reinike, Lindenweg 41, 23974 Alt Farpen, Tel: 0049 (0)151 50589799, Website: https://ostsee3rad.de (in German, use Google Translator). We had cycled through Mecklenburg-Vorpommern along the Baltic Coast four or five years ago and had enjoyed it greatly. This time however we decided to stop in one place and take day trips, rather than touring. If we were not up to touring it could be awkward if we had to cycle 50 to 80km to reach our next hotel. All the hotels were full in August so we waited until our next appointment-free week in early October. We arrived in Groß Strömkendorf near Wismar on 1 October. The cycle hire company had recommended this hotel as it has a lockable garage. The trikes cost around five thousand Euros each, so it is worth chaining them up at night in the dry. Places on railway lines or bus routes in this area, have reasonable connections especially during term time, but bus and train routes are thinly scattered. On Tuesday Herr Reinicke collected us from our hotel on his Ruhetag (rest day) when the shop is normally shut and were driven 8 or 9km to Farpen. We were very impressed with his trikes and his professionalism. He has a good hire fleet: a number of KMX trikes, two Hase TRIGO trikes, an ICE Full Fat trike, two ICE Adventure trikes and several conventional bicycles. Some of the trikes are pedelecs. Farpen is not visited regularly by bus and the nearest railway station is 5km away, so we were glad of the lift. His workshop, is a brick and timber barn dating in part from the 13th century. We were both given ICE tadpole machines. Judith's was an ICE Adventure HD, so that we could both ride the same ICE tadpole machines. Herr R Rapidly twiddled the seat and width of the handlebars were changed to fit Judith's cross section. The previous hirer must have been well fed. The boom on Judith's trike was shortened to fit her lack of inches. She was then sent off to ride gingerly round the block. I was assigned an ICE Adventure pedelec fitted with a Pendix electromotor. I had taken shoes for click pedals and after adjusting the boom to fit me, Herr Reinicke changed the pedals. I was lent a Hase TRIGO Up - a delta trike - fitted with a Shimano Steps motor to play with while this was going on - very enjoyable. It is a pity the Hase company does not offer a folding version of this trike, because it ticks almost all the boxes and I think we'd buy one, but DB - German Railways and other German railway operators do not allow unfolded trikes on their trains. "Get in, you so and so!" Both trikes were in excellent condition and well maintained. They both had a 3x8 SRAM Dual Drive hub gear/derailleur system with twist gear grips mounted on the steering bar ends. In my case the trike was fitted with a Pendix brushless electromotor and a Pendix battery (https://pendix.com/edrive.html). The Pendix is a German designed and built system, often used as a bolt-on modification for a unpowered bike. I found it excellent and very smooth in operation contrary to the one review I saw of the motor. The feature I found slightly odd was the on/off and power controls mounted on the battery. We are more used to a combined controller, battery charge level meter and speedometer mounted on the steering. Although there is an app that we could have used to control the power output of the motor, we did not download it. On the last day I pedaled some way before I realised that the motor was not switched on. "Cheer up. It could be worse." I cheered up and matters got worse. This was very true in this case. It was not cycling weather, so we took a bus to Wismar to look at the Altstadt (old town) and buy various essentials. Just to make matters clear, we are both prepared to cycle in the wet if we need to get to our next booked hotel or catch a train. We've been there, done that. If there is no need to cycle why run the risk of getting wet through? On Wednesday, the German Day of Reunification we intended to spend the day cycling to one of the coastal villages between Travemünde and Wismar to meet a friend. He decided however that it was too cold and windy to cycle so he drove over from Lübeck by car. I had another rehearsal of fitting my shoes into the click pedals followed by a short five or six kilometre tour in the morning before our friend came. We spent the rest of the day on foot playing the tourist in Wismar, which is well worth doing, but it wasn't cycling. The town was Swedish for about 150 years until the start of the nineteenth century. Gradually the older houses and the churches in the centre left unrepaired for the better part of 40 years in the German Democratic Republic have been restored. The town is historic and charming. On Thursday morning we had a good Mancunian drizzle and decided to wait an hour before leaving. We set off across the cyclepath on the causeway to the Insel Poel (Island of Poel). We crossed to Kirchdorf and found a NETTO supermarket to stock up on emergency chocolate and then through the village to reach the harbour. Beyond the village we picked up the excellent cycleway again and cycled over gentle hill and dale to Timmendorf Strand, a small resort on the outer edge of the island. 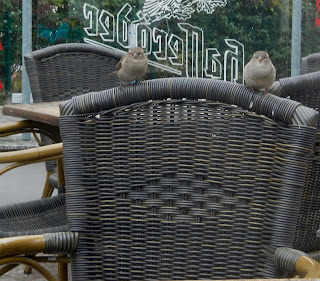 We enjoyed Kaffee und Kuchen there watched by two pairs of eyes willing us to drop crumbs. 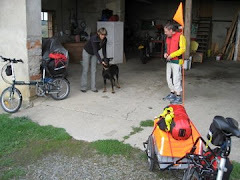 We then set off on agricultural roads through fields of Brussel Sprouts to follow the route near the shore north. 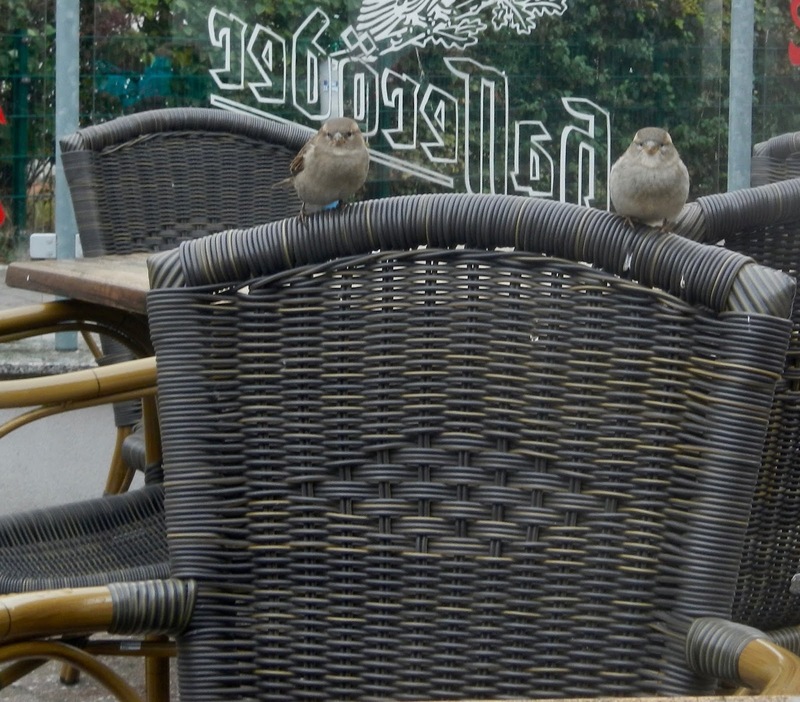 Brussels are a speciality of the area, much loved by local children, according to an informant. 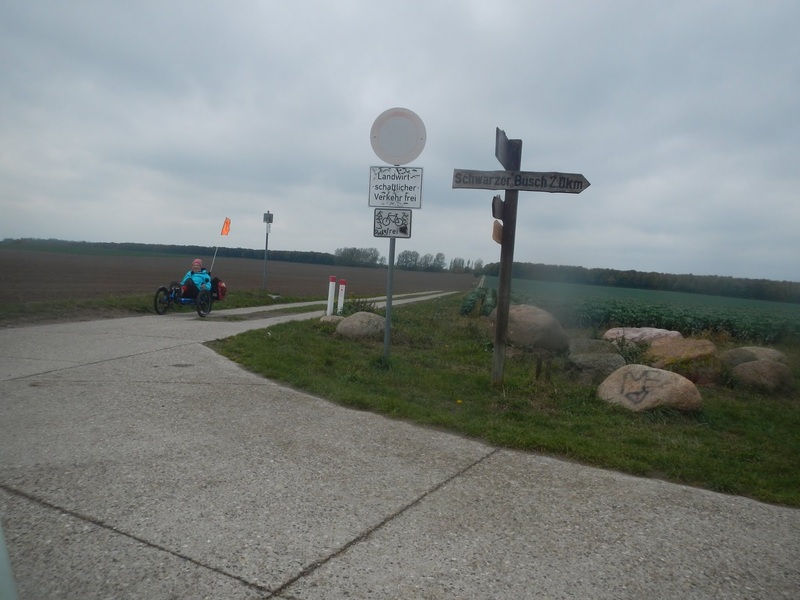 We dropped down into the hamlet of Am Schwarzen Busch, cycled along the sea shore on unmade forest tracks to reach Gollwitz before turning south towards Fährdorf and the causeway back to our hotel. Herr Reinicke was due to pick up his trikes at 17:00 Hours. Judith's trike was a little too wide for the typical German Democratic Republic two concrete strip agricultural roads north of Timmenorf Strand. Notice the large legible signposts on the right. To sum up we were very satisfied with the trikes. This an excellent cycling area with good cyclepaths and signposting. There is no shortage of cafes and accommodation, but one needs to book ahead in the summer season. There are plenty of good beaches and enough pleasant rolling hills to add interest for cyclists, especially for those with electrical support. J says that despite initial worries she found the trike easy to handle and the gears adequate, even able to have a five minute conversation, on a hill, while sitting in the driving seat. For a number of health related reasons, I am thinking of acquiring a recumbent e-trike. If you look at the catalogues of the four major recumbent trike European manufacturers (AZUB (CZ), Hase (D), HPVelotechnik (D), ICE (GB)) you quickly realise that these vehicles are not cheap. It is not surprising since the trikes are hand built and in very small numbers. If you are looking for a fully equipped e-trike you can expect to shell out at least 7000 Euros, maybe a thousand or so more. If you take delivery of a trike and then tell the neighbour that you've just coughed up the price of a newish secondhand car for a funny little vehicle, he will think you are off your trolley. We have a car we bought secondhand when it was 4 years old. It cost us 8000 Euros some years ago. Is riding an e-bike as good for you as riding a normal bike? There is an article in today's Mail Online (http://www.dailymail.co.uk/news/article-6001373/Riding-electric-bicycle-just-healthy-pedalling-normal-bike-researchers-say.html) that reports on work done at the University of Basel in Switzerland that has shown similar improvements in fitness amongst overweight unfit patients riding e-bikes as those riding normal bicycles. The addition of the motor allowed longer rides. The only niggle I would have with the article is that the photograph accompanying the article shows a man pedalling a non-electric Klapprad. Slight plug to start with. We wrote a book on cycling in Switzerland some years ago now. It was published by The Cicerone Press in Northern England. Cicerone originally published books about hill walking and mountaineering. Later the company branched out additionally into books about cycle touring and fell running. The company produces a digital newsletter for which we have contributed the odd article. I was just sent the latest version of the newsletter in which there is a article on e-biking in the Alps. Paean of praise would be a better description. We are in process of buying e-bikes or maybe e-trikes so I found the article: https://www.cicerone.co.uk/e-bikes-are-just-for-softies an excellent introduction into using e-bikes. If the £2000 to £3000 price tag of a decent e-bike puts you off buying an e-bike, do not forget that you can hire e-bikes reasonably cheaply in just about all tourist areas on the continent which cuts out the problems of transporting the bikes from home. Speed pedelecs mixing with normal cycle traffic? A few weeks ago I read about the new EU regulations meaning that e-bikes should be insured and thought this would make e-bikes/pedelecs less popular. I was not in favour of this idea, but I think I am changing my mind with the latest news from Denmark. Although the insurance changes could well be the start of compulsory helmet wearing, licence plates for bikes, bike riding tests and probably insurance for normal bicycles and their riders. A normal pedelec within the European Union is designed to have a maximum powered speed of 25kph (15mph). If you wish to reach speeds faster that 25kph you will need to pedal and considering that most e-bikes are heavy you (at least I) cannot cycle fast for that long. There are e-bikes that can be ridden faster up to 45kph, but these are treated as mopeds or light motorcycles and banned from using cycle paths. Some Dutch cycle paths especially in cities allow mopeds and light motorcycles to use bike paths and these cycle paths do not make for easy cycling. Playing chicken with pimply-faced youths on souped-up mopeds or scooters is not my idea of enjoying cycling touring. One of my more unpleasant cycle touring experiences was crossing the Belgian city of Ghent on cycle tracks in the morning rush hours. Apart from a group of people moving house towing trailers carrying beds and wardrobes we were continually being harassed by commuters on their work. They made their displeasure very plain at being held up as we checked our route. Just to explain, although my wife and I are well past the biblical three score years and ten, we have both cycled extensively. We are not nervous cyclists. We are not whiteheads who have recently taken up cycling. We are experienced cyclists. I commuted by bike from the central station in Frankfurt two or three km to the office for at least ten years. There is a way around this problem of decreasing the number of cars on the road while still allowing fast commutes: Build special bike tracks (cycling superhighways) for these faster vehicles. These however cost money. The costs of the planned Heidelberg - Mannheim fast bicycling link (23km long) (https://rp.baden-wuerttemberg.de/rpk/Abt4/Ref44/Seiten/Radschnellverbindung_HD_MA.aspx) will cost about 12 million Euros. Eighty per cent of the route will be at least 4m wide, lit at nights with a smooth good quality asphalt but have a Richtgeschwindigkeit (design speed) of just 30kph - less than a possible 45kph. The Heidelberg-Mannheim link will take several years to be realised. The eagle-eyed reader of this blog will have noticed a blog just over a year ago (19 May 2017) about winter cycling in Finland. I was recently sent a link to short film about a group of hardy souls cycling across a National Park in Finland in February - "Arctic Cycle" under https://www.groundeffect.co.nz/blogs/news/. Lovely photography. The film is well worth watching. Ground Effect is a biking clothing company in New Zealand (www.groundeffect.co.nz). They make good gear, in fact great gear. We have a number of their biking jersys and shirts. We started buying stuff from them because the company offers summer weight cycling jerseys with long sleeves. I have suffered from skin cancer so I prefer to wear clothing to cover up in the sun rather than using a sun cream. There is only one problem: The clothing is fairly priced, but there is a sting in the tail. Not only must one pay duty and VAT on the clothing when it arrives in Europe, but also when the goods are presented to customs, you need to pay the carrier - £8 in the UK for each package for this arduous work if you have your order sent air mail. If memory serves me rightly FedEx, the other carrier used by Ground Effect charges more. If your order comes in two packets it can get quite expensive. Ostfriesland (East Frisia) is the stretch of Germany between the Dutch - German border on the River Ems to Wilhemshaven. It is great cycling country criss crossed by cycle routes with a multitude of bike hire shops.